There’s nothing more enjoyable than a tasty treat after a long hike in the woods. Treat your friends and family to a few snacks that you can make right from the campfire. They don’t all have to be sweet treats. You can make savory ones as well. From the traditional s’mores to the standard dinner of roasting hot dogs, there are many great ideas for you to try. The staff here at your Philadelphia RV dealer has a few for you to try. All you need for this is a bag of popcorn kernels, oil, some heavy duty aluminum foil, and a stick. In the middle of the foil, add one teaspoon of oil and one tablespoon of popcorn and fold into a pouch. Make sure to leave enough room for it to pop. Tie this pouch to a stick and hold it over the coals. Shake continuously until all has popped. Add salt, butter or flavor to taste. This sweet treat requires only a few simple ingredients: waffle cones, mini marshmallows, chocolate chips, fruit, and cereal. Simply add all of the above ingredients into a waffle cone and wrap in tinfoil. Toss this into the fire near the coals and let it cook for about three or four minutes. Bring along a can of crescent rolls, vanilla or chocolate pudding, chocolate frosting, and some whipped cream and you have a dessert that’s easy, fun and delicious. To make the éclair, wrap some dough around a stick and be sure to close the end up well. Cover with foil and cook until brown. Slide it off the stick and fill it with pudding. Top with frosting and whipped cream if desired. Have everyone make their own miniature pizza with English muffins, pizza sauce, cheese, and your favorite toppings. Just spread pizza sauce on top of an English muffin half, sprinkle with cheese and add toppings. Lay a piece of foil over the campfire grate and cook on the foil until cheese is melted and browned. 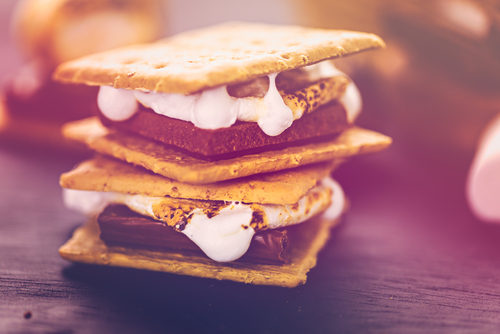 Do you have some delicious campfire treats to share with Fretz RV? Let us know!